Take a different stand or opinion and you shall be cornered quickly. Now-a-days there are very few people who respect "difference of opinion" or the uniqueness of people. Suppose you choose a career that is not very popular like, enrolling for a fine art course or sculpting rather than business management or finance or science, people start viewing you differently. Some may even stop hanging out with you. Behind your back they will tell to others that something is seriously wrong with you, and that you are not a normal person. Well, I fail to understand how does if matter that you choose what. Even for me, whether I choose to do Minimalist photography knowing the fact of it being non-mainstream and I wont be able to make premium dollars for it, or I do wedding or product photography its completely my choice. Why do people get bothered?. People are diseased with "crowd-behavior" and they want others to do the same. Why do they forget that at some point even the most popular genres of work were not so popular and it took a group of few individuals who believed in these genres and made them popular. 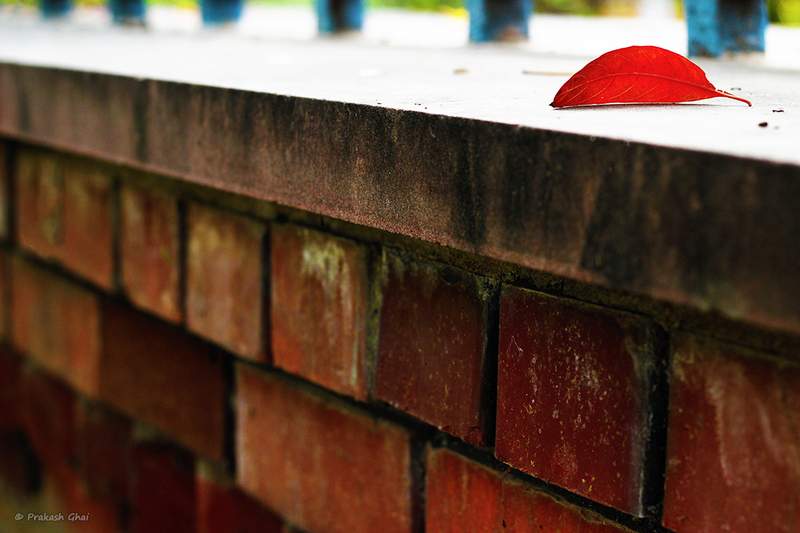 I have taken many leaf photos earlier but this one was special as the leaf was red in color. How could I not make a minimal composition with that, is what I told myself. I wanted the focus purely on the leaf and therefore I placed the leaf on extreme top right, making the shot fall under the Minimalism Category: Minimalism as Less Elements. I chopped off most part of the distracting blue fence. It was spoiling the color palette and was making my shot look more maximally minimal in nature rather than minimally minimal. I used leading lines in reverse this time, beginning from the left of the frame and broadening as they approached the leaf and hence pointing at the subject. Nice post on Smriti van Jaipur. Thanks for sharing the picture.It is a bio diversity forest by Govt. of Rajasthan. A must visit for nature lovers.